Think about what you plan to feed your cows and how to minimise wastage. Remember, cows are messy eaters and tend to throw feed around. Also consider whether you will be feeding all at once or ad lib. Hay ring feeders are re-locatable and can be useful for baled or hay or silage. If using chopped silage, ensure rings have metal ‘skirts’ at the bottom. Dividers reduce competition. A 2.2 m diameter ring caters for up to 18 cows and will hold up to 300 kg of hay or 800 kg of silage. Moveable troughs are also re-locatable but you may need a number to ensure your herd has easy access. 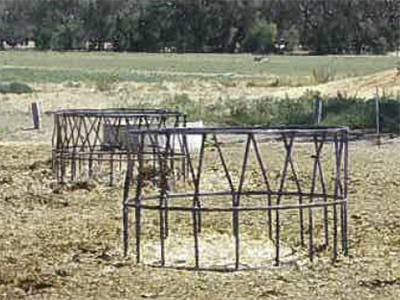 “Moveable troughs provide limited scope to control competition between cows. Careful placement of hay and silage will be necessary to minimise wastage. Old tractor tyres are a low cost option and easily re-locatable however, there is limited scope to control competitive behaviour. Place hay and silage carefully to minimise feed out wastage. Feeding strips should be 75-150 mm above foot level with a nib wall 400-500 mm above the strip to protect feed from effluent. 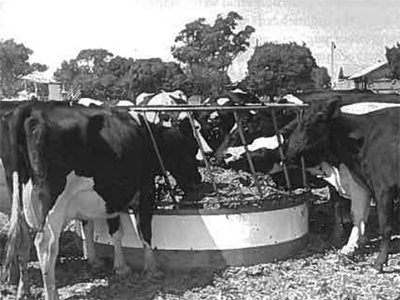 If you feed as a herd, each mature cow requires at least 70 cm feeding space. If using an ad lib approach, this can be reduced to around 35 cm per cow. While dividers reduce competition, they are not required if feeding ad lib. 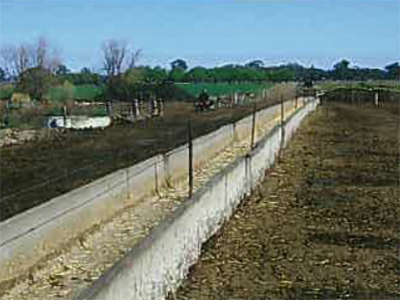 Feed barrier walls wider than 15 cm can restrict how far stock can reach. Concrete in the trough should be smooth to assist with cleaning and to minimise mould and odour problems.